Rhoeo spathacea (Swartz) Stearn in Baileya. 5: 198. 1957. Brenan in Hutch. & Dalz., Fl. W. Trop. Afr. 3(1): 23. 1968. Perennial, robust herb with short stem arising from the underground rhizome, 30-60(-90) cm tall. 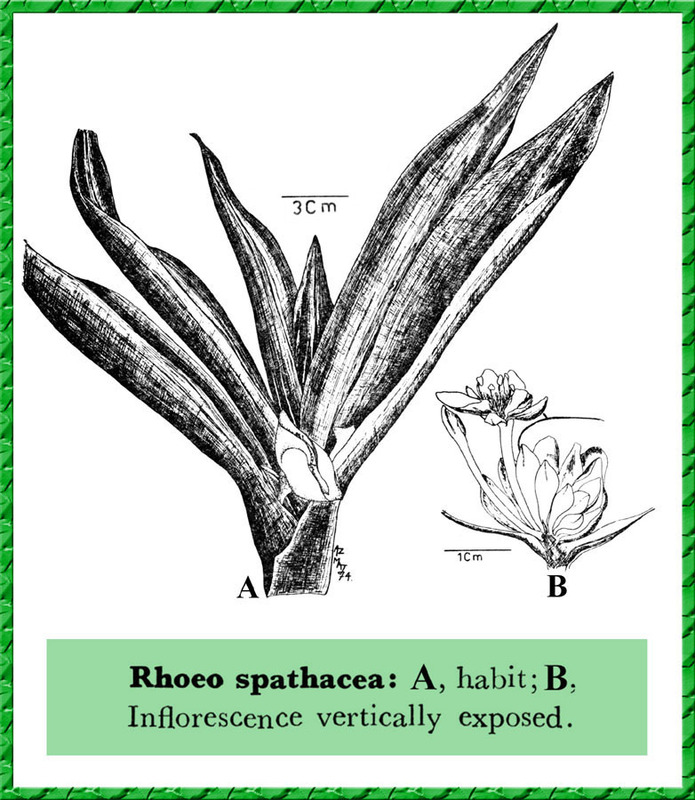 Leaves crowded on congested nodes, imbricately arranged erect, sublanceolate to oblanceolate, sheathing at base, sessile, 20-30 cm long, 3-5 cm broad, subfleshy, brittle, entire, acute, usually greenish above, purplishred beneath. Cymes condensed, axillary, enclosed by short, boat-shaped involucral bracts, 2.5-4 cm long, 1.5-3 cm broad, on short peduncles with few, smaller. sterile bractlets. Flowers white, c. 1.5 cm across; pedicels up to c. 1.5 cm long. whitish. Sepals 3, ovate-lanceolate, free, c. 5 mm long. Petals 3, ovate, free, c. 8 mm long. Stamens 6, all perfect, 4-5 mm long; filaments barbellate; anthers c. 1 mm long, sometimes 1 or 2 partly modified into petaloid structures. Ovary sessile, 3-locular with 1 ovule in each locule. Capsules ovoid, loculicidal, 3-valved. Fl. Per. almost round the year. Distribution: A native of C. America and W. Indies, often cultivated, as an ornamental, in most warmer climates, including Pakistan.